Style-wise rooted in the early 1970s rock of Yes, Genesis and perhaps a bit of Jethro Tull, with forty years of musical evolution thrown on top, as well as some folk and jazz, Travelog is a 70 minute listening experience. A attentive listening experience as well – with the shortest of the five tracks being running for just under 10 minutes and the music taking many turns. This is obvious immediately in the 20 minute opening track War Song, which starts as a symphonic rock piece, but then switches to something between rock and Scottish folk (bagpipe synths) when the war starts. The vocals of Demetrius LaFavors (who also sings on Travelog and Vision) fit the story of the song very well, taking it from rock to a folk like ballad and back. A nice detail is that the main guitar riff that comes back a few times, gets copied by the bass near the end. The bass plays a lead role on this album anyway – and in War Song there’s even room for a bass solo. 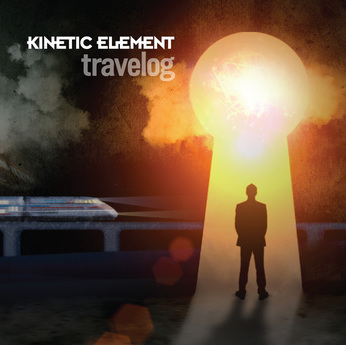 All tracks on the album have their own signature, which is not unusual, but in this case it shows the diversity of what Kinetic Element is capable of. Where War Song mixes rock and bag pipes, Travelog is more folky and sometimes pastoral in style, with beautiful classical guitar in both the intro and outro (accompanied by flute there) – with one again Demetrius, one of three guest vocalists, on vocals. Vocals are taken over by Michelle Schrotz on Into the Lair. A track with a jazzy folk feel in the beginning (bass, gypsy guitar and beautiful vocals), but building up to a full rock piece before going back to where it came from. The keys – piano, keyboard, and organ – are in control of the instrumental part. The keys are also very present in Her, sung by Mike Florio, which has a jazzy feel due to mainly the drums, and develops into a ballad with frantic keyboards underneath. That jazzy feeling is also present in Vision of a New Dawn, which is an 18 minute jazz rock journey – for me the best track of the album. As mentioned the vocalists are all guests, although Mike Visaggio (keys) and Michael Murray (drums) also perform some backing vocals. Instrumentally, each band member gets his own place in the music, as said there was even room for a bass solo on War Song. Mike Vissagio in his playing makes no secret of his love for the 70s keyboard heroes, and Michael Murray is not afraid to put in some jazz drumming instead of straight forward rock, which works out really well here. The bass (Mark Tupko) is ever present, and adds it’s own melody, as it should. Todd Russell on guitar then adds tunes and leads with great feel, for example in the solo on Her. The art work is plain and simple, nothing fancy – no lyric sheet is included. The band clearly choose to let the music speak, and in that they succeeded. This album with its long tracks may not be everybody’s cup of tea, with modern attention spans reducing rather than growing, but it’s a more than decent piece of music. Highly recommended!